Come and learn how to make a Ukrainian egg called a "psyanky". This ancient art form involves a wax resist process using real eggs, beeswax, and dyes. Ukrainian eggs are rich in symbolism and created to celebrate Spring and ensure good fortune. 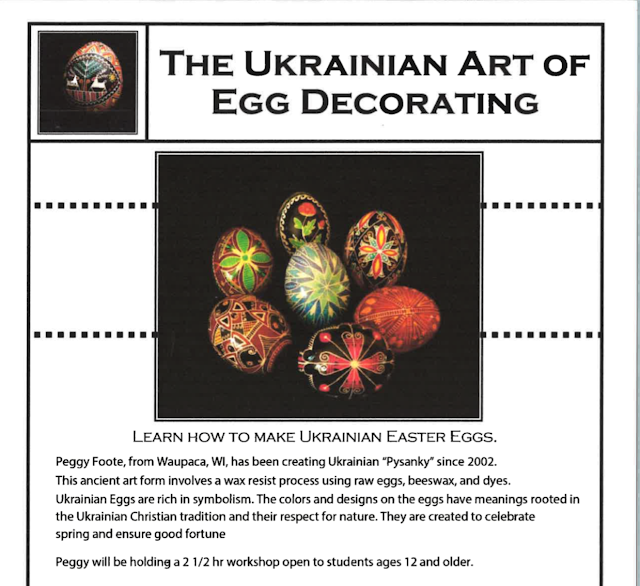 Instructor and well-known pysanky artist Peggy Foote from Waupaca, WI has been decorating eggs and teaching workshops for over 15 years. The hands-on workshop will last approximately 2 1/2 to 3 hours. Although we don't normally charge for programs, the cost is $25 per student which includes all supplies, including necessary tools and the eggs. Class size is limited to 14 people, so sign up soon. Ages 12 and up only. If you have any questions, please contact Mandie at the library, 580-7290.